This is a simple equipment that according to the preset concentration will produce the disinfectant solution directly only in an amount necessary at the particular moment. 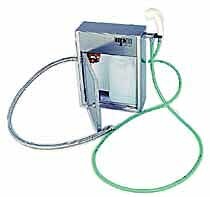 A small disinfecting device has a wide has a wide spectrum of use. It can help in a cleaning room for disinfectant solutions to be prepared for cleaning purposes. It also can be connected to the water mains everywhere the water biology composition has to be treated to guarantee it complies with the hygiene standards. Examples of use as follows: mountain cottages, pensions, simply the houses being not connected to the distribution network.